Emma Lin is wrapped in a purple scarf on a freezing December afternoon in Islamabad. She is sitting at a desk inside a Pakistani bank’s local branch – where she works as a relationship manager – that caters exclusively to Chinese customers. Lin has been living and working in Islamabad for the past three years. She says she likes the city because it has clean air and a relaxed pace of life — both rarities in Beijing where she worked for nearly 20 years at various banks. And even before she arrived in Islamabad, she already had an idea about what life in Islamabad would be like. “I already had an uncle and a few friends who lived here, so it was not difficult for me to settle down,” she says in functional English. There is also another application that assists Mandarin speakers in ordering food from Pakistani restaurants. Sports facilities in Islamabad are similarly developing their own applications to help with booking places such as basketball courts which are usually packed with Chinese players on holidays. Around 10,000 Chinese live in Islamabad, according to figures provided by diplomatic officials. Another 35,000 or so live in other parts of Pakistan. Most of them are working on projects linked to the China-Pakistan Economic Corridor (CPEC). Others are young professionals employed by Chinese corporations in construction, energy and mining sectors. There are also small business owners and students — a majority of them coming from northern and western parts of China. Since most of them have moved to Pakistan without their families, they prefer to stay for no longer than a year or two. Only in some cases do they stay for up to five or 10 years. Due to the short nature of their stay, most of them do not feel the need to learn local languages. Their cultural understanding of Pakistan also remains limited. Their isolation is heightened by the availability of facilities that cater exclusively to a Chinese clientele. Since May 2017, for instance, a Chinese language newspaper, Huashang, has been coming out of Islamabad every week. Huashang has five people on its editorial staff. All of them are Chinese. It has eight pages and covers the breadth of Pakistan-China relations, culture, sports, food and business. Its editor, Qiu Shang, who is also known as Tom, worked at a newspaper in China until he moved to Pakistan in 2017. The newspaper attracted so many readers within a short span that a major Pakistani English daily, The News, entered into a partnership with it in October 2017. The two newspapers are now distributed together once a week across Pakistan. Islamabad is yet to experience a substantial economic and financial impact from its Chinese population. For one, their presence has had no discernible bearing on house rents. The real estate market in Islamabad faced a severe slump early in 2018 when around 1,600 houses fell vacant after a number of foreign missions shifted their offices and staff residences to the Diplomatic Enclave either due to security reasons, or under orders from the city authorities. “Rents fell by one-third,” says the executive of a major Islamabad-based real estate firm, wishing not to be identified by name. The Chinese presence did not compensate for that. “Many local houseowners thought having an expat Chinese community would be a bit like having the Americans here,” says the executive. “They were in for a surprise when they discovered that the Chinese are tougher negotiators than most seasoned locals. They neither have issues with security the way westerners do, nor are they as extravagant,” he says. They rent houses at below-market rates and make payments only in rupees, he adds. This explains why the Chinese living in Islamabad are mostly found in comparatively cheaper areas of the city — such as the G and I sectors. Only a few professionals, who have landed well-paying jobs with private companies, choose to reside in the upscale F sectors. Islamabad has many manifestations of Pakistan-China friendship — ranging from huge convention halls like the Pak-China Friendship Centre to food and tea stalls with murals of Chinese President Xi Jinping or the founder of Communist China, Mao Zedong. Then there are some other signs of large-scale Chinese presence in the city. The number of Chinese children in various private schools across Islamabad, for instance, is increasing, with many teachers reporting at least three or four Chinese students in their classes. A few schools even have more Chinese students than Pakistani ones. A number of new restaurants have also popped up across the city to cater to a burgeoning Chinese population. Some of these are owned and run by Chinese while others have local owners but a Chinese staff. They offer hotpots, dumplings, pulled noodles, ramen, fish and tofu that taste nothing like the Chinese cuisine most Pakistanis are used to. One of the most popular of these eateries, Hua Xia Qing, is located in a commercial plaza in the F-7 sector. It has a Chinese chef, a Chinese waiter and a Chinese receptionist to ensure customers get exactly what they want. While its menu is predominantly Chinese, it also has an odd Pakistani entry: dumba karahi, a Pashtun delicacy made of lamb meat. 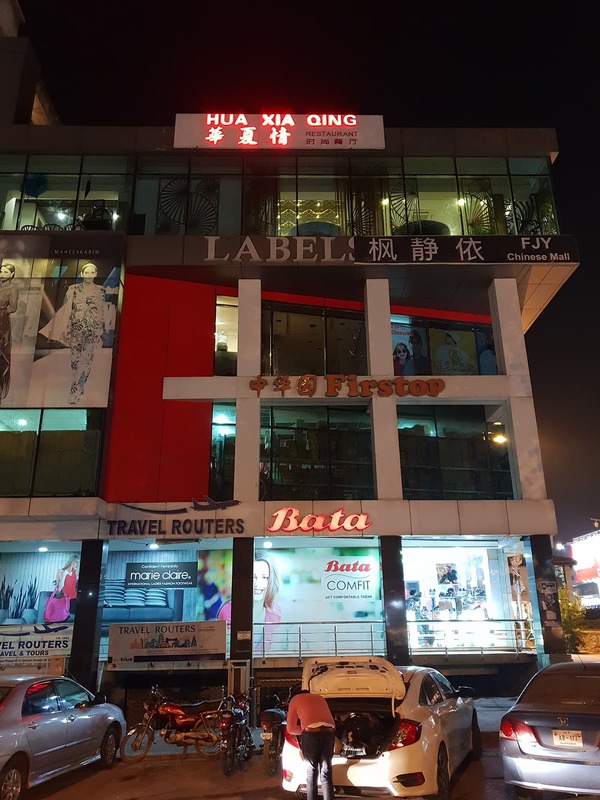 “We have added a barbecue section to our menu after persistent demands by our customers — most of whom are Chinese,” says Hua Xia Qing’s young manager, Haider Ali, who has learnt enough Mandarin to converse with his clients. Several marriage bureaus in China have Pakistani women as potential brides on their lists. The restaurant purchases its supplies from a supermarket called Firstop — located two floors below it in the same plaza. 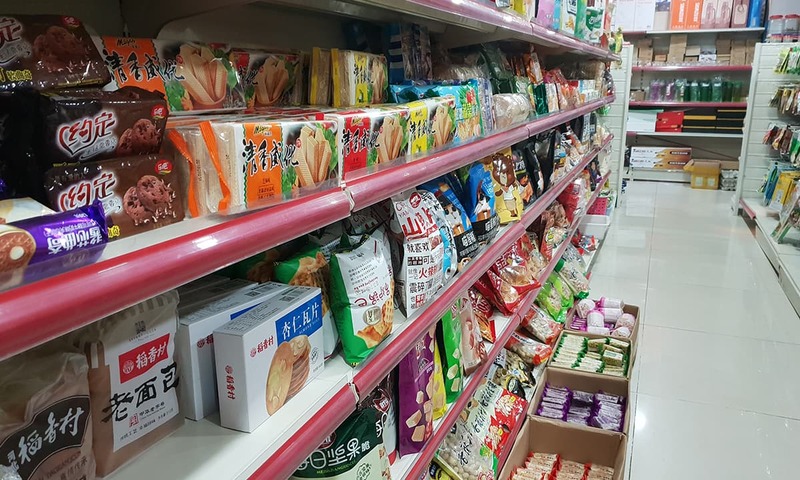 Its shelves are stocked with every Chinese product imaginable — from office equipment and skipping ropes to mushrooms and pickled chicken feet. Under the shadow of the gleaming plaza is Kim Mun restaurant: evidence of an earlier Chinese assimilation in this part of the world. One of Islamabad’s most loved eateries, it has been around since 1980, having pioneered Chinese cuisine in the city. Ancestors of the owners of Kim Mun came to the Subcontinent along with a dozen other families from Guangdong province in China to escape Communism. They first settled in Calcutta but shifted to Rawalpindi in 1947. “I was born, brought up and educated in Islamabad,” says 38-year-old Steven Lee whose family owns the restaurant. “I speak fluent Urdu, English and even a bit of Punjabi but, at home, we still speak Hakka Chinese,” he says, referring to a dialect after which the Chinese cuisine available in Pakistan is also named. Only a few Hakka-speaking Chinese migrants are left in Pakistan, according to Lee. Most of them, especially the younger ones, have migrated again – this time to Canada – because of security concerns. More recently, a new trend has emerged: marriages between Pakistani women and Chinese men. Several marriage bureaus in China have Pakistani women as potential brides on their lists. There are also matchmakers operating within Pakistan who pair Chinese men with Pakistani Christian women. One ostensible reason for this trend is that Chinese men do not ask for dowry. They also offer the possibility of a more comfortable life, in either Pakistan or China, than most Christian women have here. On the flip side, these marriages provide an opportunity to Chinese grooms to settle down in Pakistan — away from the one-child policy back home. Once children born to these mixed families grow up, the cultural interaction between Pakistanis and Chinese living here may increase. For the time being, it remains limited to a few language coaching centres. 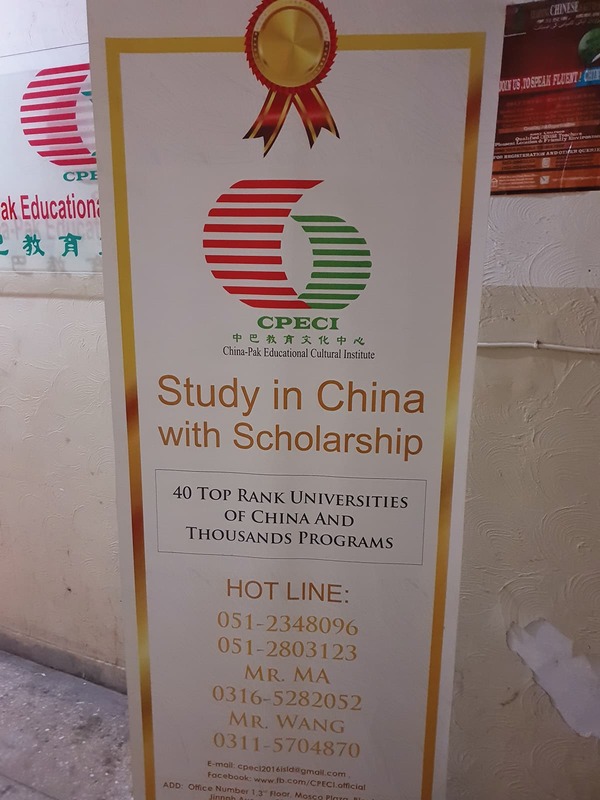 Pakistani parents, who want to give their children an edge in a China-dominated global economy, are enrolling them at these centres. One such coaching centre, the China-Pakistan Educational Cultural Institute, is located in a dingy plaza in Islamabad’s Blue Area. It was set up in 2016 by Ma Heju, who comes from the Chinese province of Gansu and has been living in Islamabad for a decade. The institute offers courses that help students pass HSK – the official Chinese language proficiency test – up to Level 6. It has 100 students: 70 of them are Pakistanis learning Chinese and 14 of them are Chinese learning Urdu. Another 16 are learning English. Most of its staffers are Muslims from the northern Chinese region of Ningxia. Li Qiang, 23, is one of them. He is enrolled at Islamabad’s International Islamic University as a student and works as a marketing manager for the institute in his spare time. His boss, Heju, also received his PhD in Comparative Religion from the same university. On a recent December day, Qiang is sitting next to a window with a sunset view of the Margalla Hills. A laptop is propped open in front of him and an Arabic workbook is spread over his keyboard. He speaks limited English and Urdu but spends a lot of time translating newspaper articles from both into Arabic. Most of the 800 or so Chinese students in Pakistan are enrolled at the International Islamic University. They chose to study in the university because a relative or a neighbour might have also done so. “I came to know about the International Islamic University because my brother was studying here,” says Li Tong, who is also from Ningxia. Chinese students also hear about the university through WeChat groups, he says. Some of these students take up Islamic names much like how Chinese take up western names when they go to Europe or North Africa to study or work. They mostly study Islamic subjects — something they cannot do in their home country. According to Tong, many Chinese students in Pakistan do not complete their degrees and, instead, start running small businesses. His elder brother, for instance, is running a small travel and transport company in Islamabad. Most of them never want to return to China. “Because conditions are tough for Muslims back home, they would prefer to stay on in Pakistan,” says Tong. ...and how many Pakistanis live in China? Think the possibilities if Pakistanis & Indians could visit and do business . The future would have been much brighter. 'China just does not belong in our part of the world, south and even southeast Asia. A few exceptions notwithstanding, how many in this part of the world would want their sister or daughter marrying a Chinese, no matter how high placed this guy is? You make China ''brother" they will soon want to become "brother-in-law" there is a shortage of women in China because of their previous ''one child policy" where more often than not male embryos were taken to term and female embryos aborted.' Besides, the Chinese men would kill to get a beautiful Pakistani bride as opposed to a leftover Chinese bride. Think about it: are pakistani men able to marry Chinese women? -- nope, it is only Chinese men able to marry pakistani women.